Social Security is in dire financial straits, but that's nothing new for this long-troubled program. Social Security spent $49 billion more in 2010 than it took in as tax collections. By the time 2011 ends, it expects to outspend collections by another $46 billion. At this rate, the program's much-touted "Trust Fund" is expected to be depleted by 2036; without that fund, benefits are expected to fall to about three-quarters of current promised levels. As bad as that may sound, it's actually business as usual. To cover the massive obligations of the plan, tax rates have risen repeatedly over its history. What started as 2% of the first $3,000 of income (half paid by you, half by your employer) is now scheduled to be 12.4% of the first $110,100 of income in 2012. On top of that, the "full retirement age" is creeping up from 65 to 67, which effectively means younger workers will be paying more for a longer time to get their full benefits. Even with repeated efforts to shore up the program by raising taxes and cutting benefits, Social Security's collapse seems virtually inevitable. A huge part of the problem is driven by demographics. People are living longer and having fewer children. Those who were born in and before the 1930s -- the era when Social Security got started -- simply weren't expected to live all that far into their 60s, much less past the retirement age of 65. The American birthrate has fallen steadily, too -- from 18.7 live births per 1,000 population in 1935 to 13.8 per 1,000 in 2009. To top it off, the economy has of course been less than stellar for the past few years, resulting in a smaller percentage of the working age population actually working. The civilian labor-force participation rate is down to 63.9% as of November 2011 -- down from 66.6% a decade earlier. These demographic trends have been a long-term challenge for Social Security, the solvency of which depends heavily on having a large workforce supporting a small number of retirees. The economic weakness only makes it worse. Now that Social Security is paying out more than it collects in taxes, another problem with its funding mechanism is becoming apparent. The Trust Fund is something of an accounting fiction, stuffed with U.S. Treasury debt. The taxes collected have long ago been spent, with any Social Security-specific surplus collections going to fund other programs. As Social Security no longer provides surplus funds to the Treasury, its deficit is something of a double whammy. First, the Treasury loses that source of revenue, and second, it needs to make up the IOUs being redeemed. That results in an even deeper general revenue deficit, higher taxes, and/or the need to lower spending on other government programs. Put it all together, and the one thing becomes abundantly clear: Social Security won't last forever in its current form. The key questions are "What will change?" and "When will it happen?" 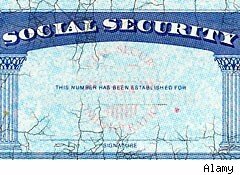 While nothing is certain until the laws actually change, those who are currently receiving Social Security will likely be spared the brunt of the changes. About the biggest risk facing current recipients is the potential that the "Cost of Living Adjustment" may be altered in a way that lowers the rate at which benefits are adjusted upward for inflation. Nobody is seriously talking about cuts to current recipients' benefits, just slowing the rate of growth for those payments. It's those who are more than 10 years from retirement that have the most to worry about. If nothing changes, benefits will be forcibly reduced (in nominal terms, not just inflation-adjusted ones) when the Trust Fund's accounting value vanishes about 15 years after that point. People more than 10 years from retirement have a real chance of still being around to feel the pain of those reductions and/or of still working as taxes are raised to try to cover the shortfall. If you are in the age group staring down likely substantial cuts in your future benefits, the sooner you get started saving to cover that gap, the better your own retirement can be. Start with these three steps you can take to improve your chances of winding up financially comfortable, even if Social Security does eventually fall apart completely.